These are elements which have the same atomic number but different atomic mass. They have the same atomic number because the number of protons that are inside their nuclei remains the same. 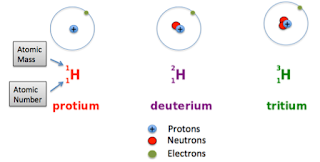 But, they have different atomic mass because the number of neutrons that are also inside their nuclei is different. As the number of protons inside nuclei remains same, therefore the overall charge of the elements also remains same as in isotopes: no of protons = no of electrons. Hence, as isotopes overall charge remains neutral, therefore their chemical properties will also remain identical. Therefore, Isotopes are chemically same but physically different. These are elements which have same atomic mass but a different atomic number. Hence, as isobars have different atomic number, therefore, they have a different number of electrons, and their chemical properties are different. The light nuclei have unstable isobars. Heavy nuclei have stable isobars and these occur in pairs. Therefore, Isobars are chemically different but physically same. These are elements having the same number of neutrons.